This piece of Southwest Zuni Jewelry is sterling silver inlay, and we at Twin Rocks consider it a particular find! 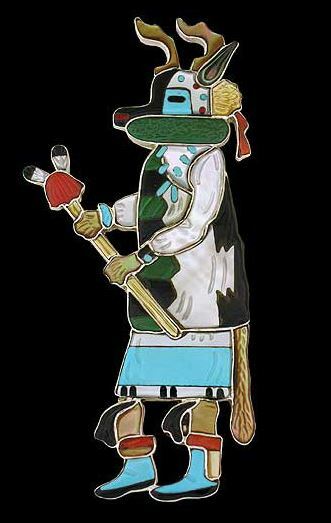 This Deer Kachina that can be worn as a pin or pendant. Set with green malachite, the blackest jet, mother of pearl, coral from the faraway ocean, and the iconic Southwest stone, turquoise. It is a true beauty. Expertly crafted by artist Andrea Lonjose Shirley, it may be the perfect gift, and it’s certainly an heirloom waiting to happen! Another type of mosaic work, called overlay inlay, this piece features two pieces of silver. One is for the backing and the second, with a pattern cut from the silver, is soldered on top. Instead of leaving the silver empty, as in Hopi overlay, zuni artists fill the opening with stones laid in to form a mosaic design. It’s an intricate process and it takes a steady hand, a fine eye, and an imagination that is boundless. If you’re cruising around the Great Southwest, you’ve just finished ooooo-ing at the Grand Canyon, or you’re about to explore Mesa Verde, stop by Twin Rocks. The art is amazing, the folks are friendly and there’s a cool drink with your name on it at the Twin Rocks Café.